SKA Global Headquarters, 26 November 2018 – The Square Kilometre Array Organisation (SKAO) is today releasing its first ever Science Data Challenge, giving astronomers a taste of the highly detailed images the SKA will produce. Developed by the SKAO’s Project Science team, the challenge requires the analysis of a series of high resolution images created through data simulations. Researchers are invited to download the images and use their own software to find, identify and classify the sources. The key aim of the series of Data Challenges is to prepare the science community for the kind of data products they will receive from SKA observations, and to gather valuable feedback which will inform the development of data reduction procedures. “We’re also eager for the wider astronomy and physics community to get involved in the challenge, beyond the radio community, so that we can share in their expertise and ideas,” Dr. Braun adds. The first Science Data Challenge consists of nine large images, each being about 32,000 pixels on each side and 4GB in size. They show how the SKA’s mid-frequency array, to be located in South Africa, would see the radio sky at three different frequencies (560 MHz, 1.4 GHz and 9.2 GHz), and at three depths: eight hours, 100 hours and 1000 hours of observing time. A longer observation allows astronomers to see deeper into the Universe, revealing more objects within the field of view. Future Science Data Challenges will also simulate datasets for the SKA’s low-frequency telescope, which will be sited in Australia. “This is an exceptionally detailed representation of the sky offering a wealth of information for astronomers,” says SKA Project Scientist Dr. Anna Bonaldi, who has been leading development of the data challenge. “We are excited to see what our colleagues are able to draw from this, and from our future challenges which will become progressively more sophisticated over the next few years. 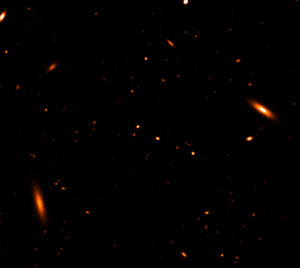 To create the images, Dr. Bonaldi used a statistical model for the kinds of sources that occur throughout the universe, based on the most recent sky surveys carried out at many different frequencies. This allowed her to predict what the SKA, as a hugely sensitive telescope, will be able to see. 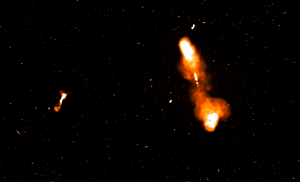 There are some 10 million sources in two categories: star-forming galaxies like our own Milky Way, and Active Galactic Nuclei (AGNs), taken from the University of Manchester’s Atlas of DRAGNs, a catalogue of high quality images of radio galaxies. This is the first in a series of data challenges being planned by the SKAO, some focusing on science but others covering topics such as software algorithms or data transfer issues. “This is an important moment on our journey towards delivering science results with the SKA telescopes in a few years’ time,” says SKA Director-General Prof. Philip Diamond. Responses to this first Data Challenge that are submitted by the 15 March 2019 will be evaluated and presented at the SKA Science Conference the following month. Full details of how to take part are available on the SKA Science website.